Relative Strength Index, or RSI, is a popular indicator developed by a technical analyst named J. Welles Wilder, that help traders evaluate the strength of the current market. RSI is similar to Stochastic in that it identifies overbought and oversold conditions in the market. It is also scaled from 0 to 100. Typically, readings of 30 or lower indicate oversold market conditions and an increase in the possibility of price strengthening (going up). Some traders interpret that an oversold currency pair is an indication that the falling trend is likely to reverse, which means it’s an opportunity to buy. Readings of 70 or higher indicate overbought conditions and an increase in the possibility of price weakening (going down). 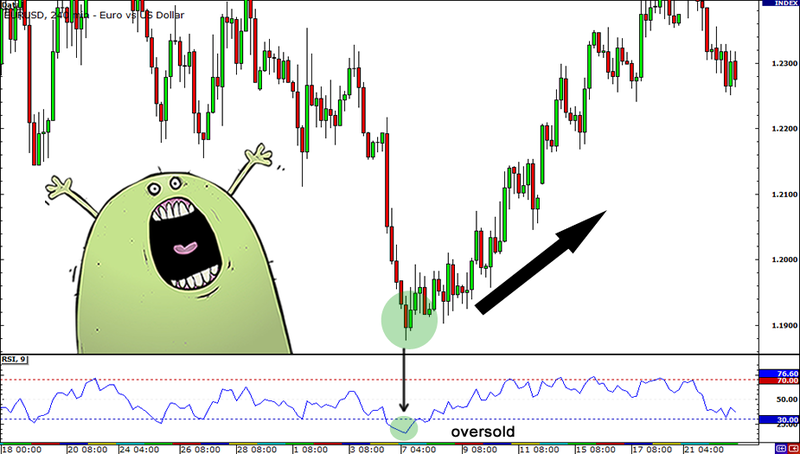 Some traders interpret that an overbought currency pair is an indication that the rising trend is likely to reverse, which means it’s an opportunity to sell. In addition to the overbought and oversold indicators mentioned above, traders who use the Relative Strength Index (RSI) indicator also look for centerline crossovers. A movement from below the centerline (50) to above indicates a rising trend. A rising centerline crossover occurs when the RSI value crosses ABOVE the 50 line on the scale, moving towards the 70 line. This indicates the market trend is increasing in strength, and is seen as a bullish signal until the RSI approaches the 70 line. A movement from above the centerline (50) to below indicates a falling trend. A falling centerline crossover occurs when the RSI value crosses BELOW the 50 line on the scale, moving towards the 30 line. This indicates the market trend is weakening in strength, and is seen as a bearish signal until the RSI approaches the 30 line. RSI can be used just like the Stochastic indicator. EUR/USD had been dropping the week, falling about 400 pips over the course of two weeks. On June 7, it was already trading below the 1.2000 handle. At the beginning of the chart above, we can see that a possible downtrend was forming.